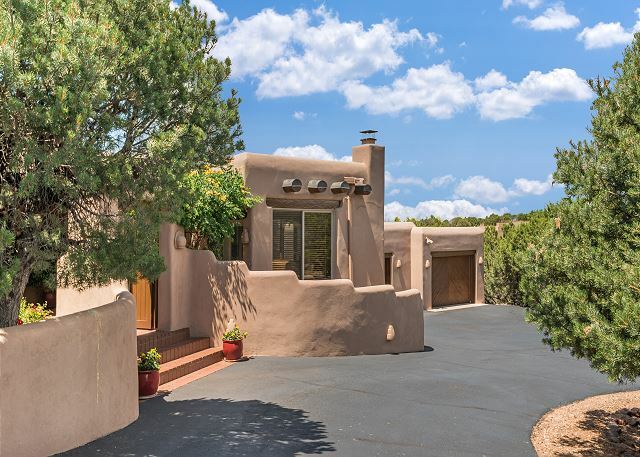 This home features formal and informal living/dining spaces, an open sundrenched kitchen, a family room, a reading room, and a private bedroom wing, all in 3,160 interior square feet. 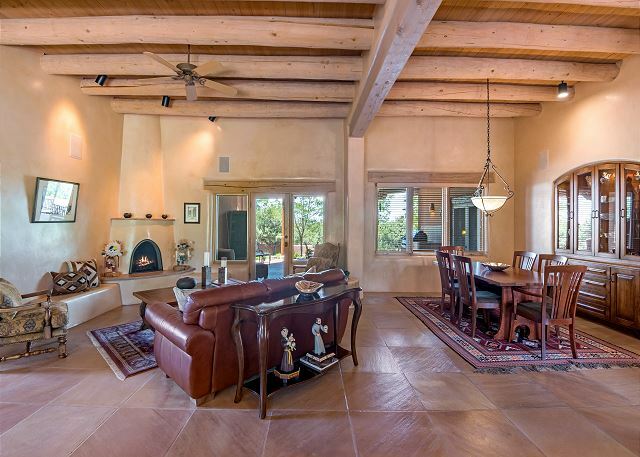 It has a wealth of Southwestern accents, including stone floor tiles throughout, vigas in every room, corbels, lighted nichos, bancos, wood lintels, skylights, and plaster walls. 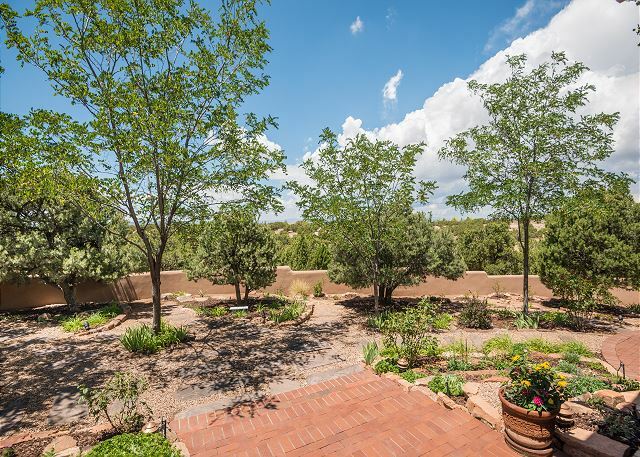 It enjoys sweeping views of the Jemez Mountains while being nestled amid beautiful native pinons, junipers, and aspens. 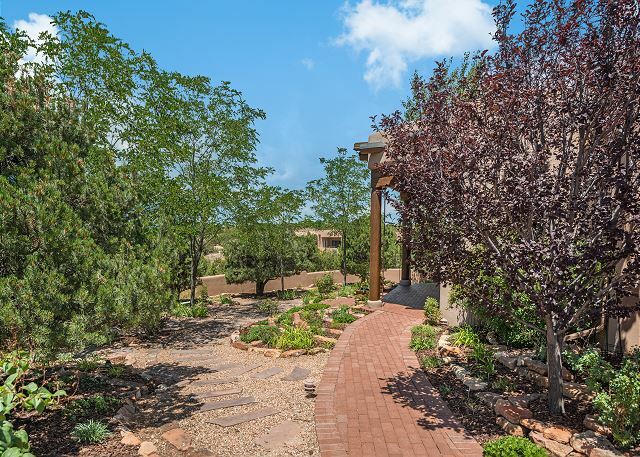 The paved circular driveway leads to a wooden gate which opens to a colorfully landscaped courtyard. 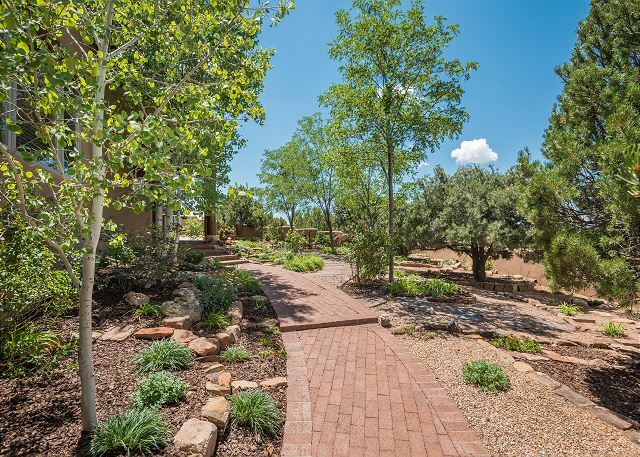 Trees, grasses, flowers, and ornamental stones contribute to the experience. 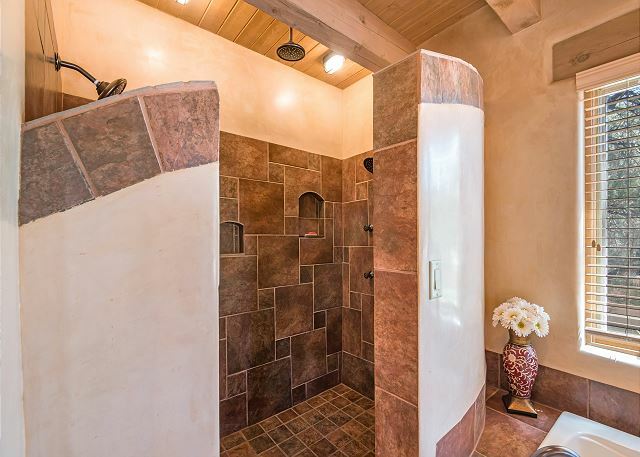 A brick path winds toward a small portal that introduces the home. 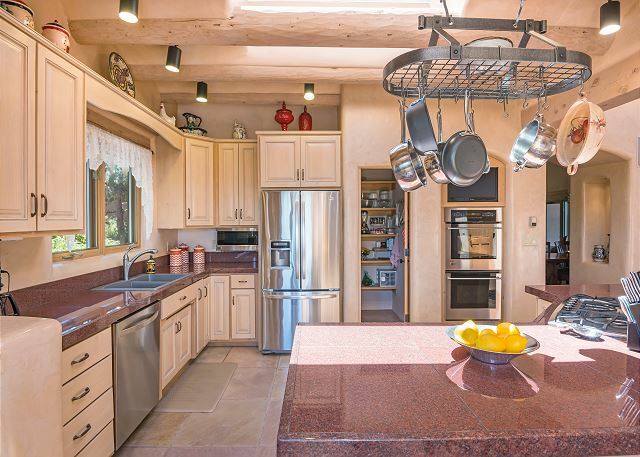 When arriving through the over-sized three-car garage, the kitchen is just a few steps away. The heart of the home is a generously proportioned living room offering comfortable areas of living, dining, reading and entertaining, and a soaring ceiling with vigas, elegant stone tile flooring, a corner kiva fireplace, built-in bookshelves, a two-sided custom built-in china cabinet with glass shelving and lighting, and surround sound. 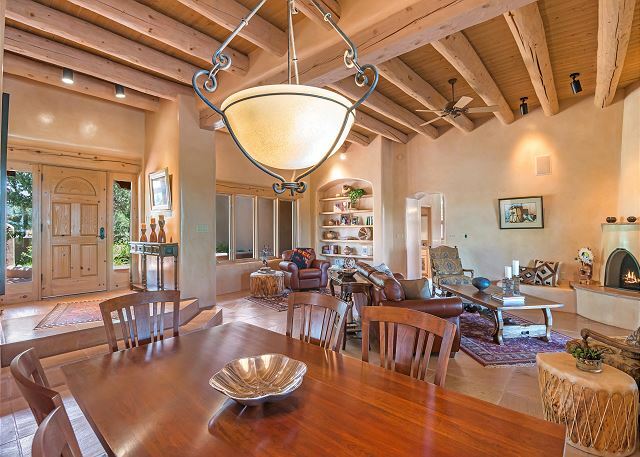 Adjacent to the formal living area is a cozy library, with beautiful built-in book shelves, spot lighting, a large window facing the courtyard, and plenty of room for a couple of comfy reading chairs. 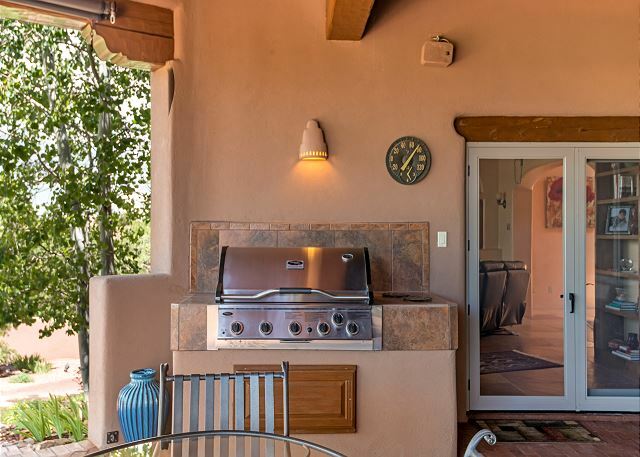 Outside the living room is a relaxing, large, cool, and comfortable portal, made for alfresco dining/cooking, and entertaining. 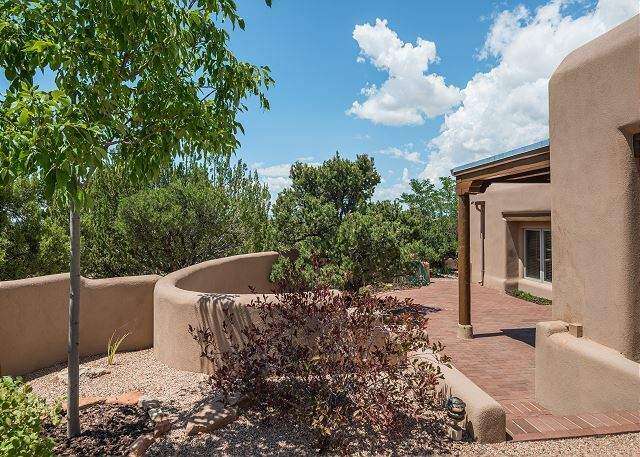 The portal celebrates captivating mountain views and features handsome brick paving, vigas, roller-operated sunshades, and a quality built in gas grill. 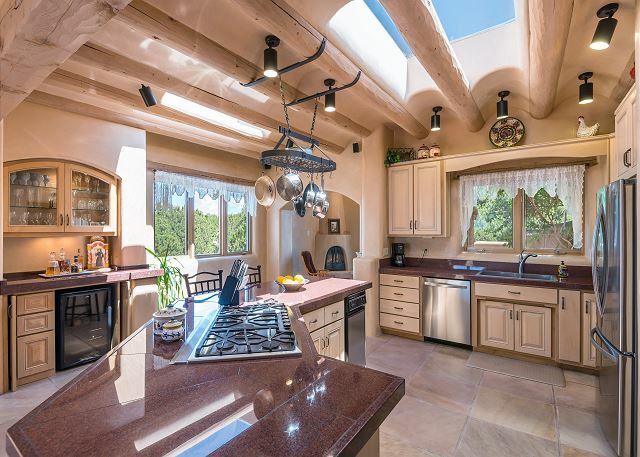 The expansive kitchen is a fantastic space filled with sunlight. 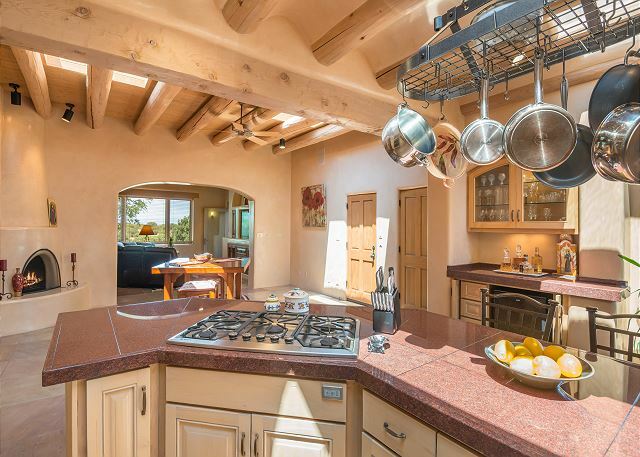 Any cook will appreciate this kitchen with its granite countertops, plentiful cabinets, walk-in pantry, and stainless-steel appliances. 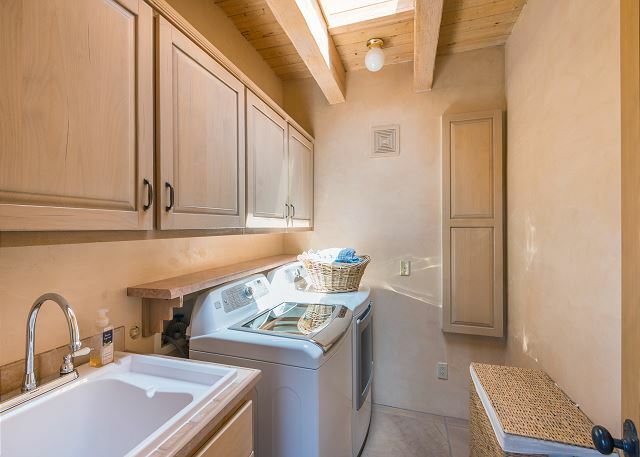 Adding to the appeal is a built-in bar with wine chiller, plenty of storage space, and a huge island with a gas cooktop. 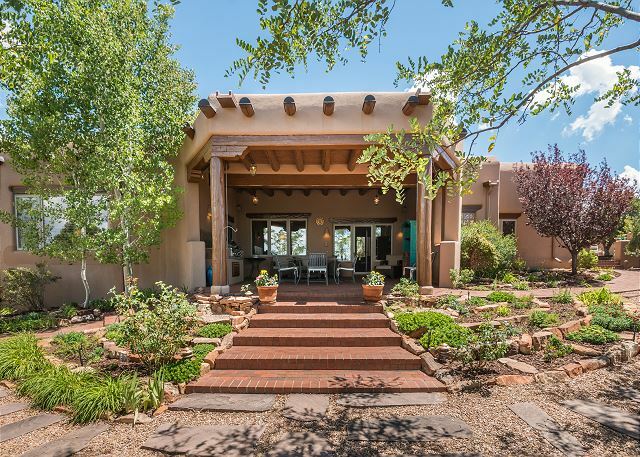 Nestled off to the side is a charming coffee nook, featuring a kiva fireplace, abundant windows, and a glass door to a small patio with an arbor draped in verdant vines and colorful flowers. On the other side of the kitchen is a generous informal dining area with built in lighted china cabinet and corner kiva fireplace. 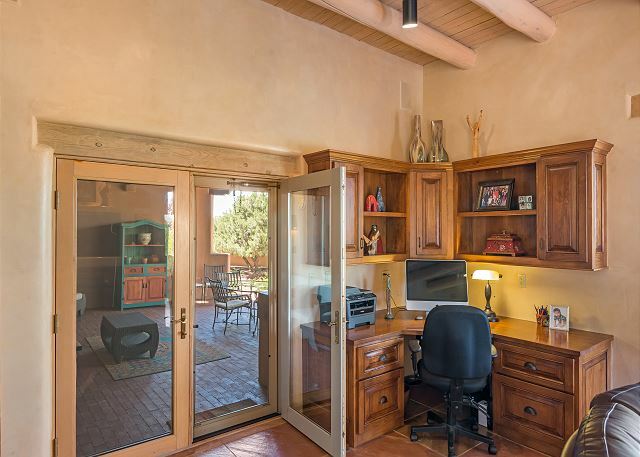 Just beyond, through an arched opening, is the media room, which features a built-in area for a TV, built-in bookshelves, and a spacious, professionally appointed desk. 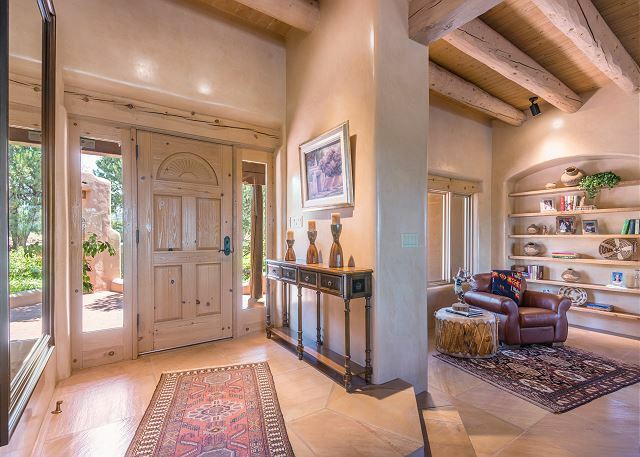 A wide window looks out toward the mountains to the west, and screened doors open to the back yard and the main portal. 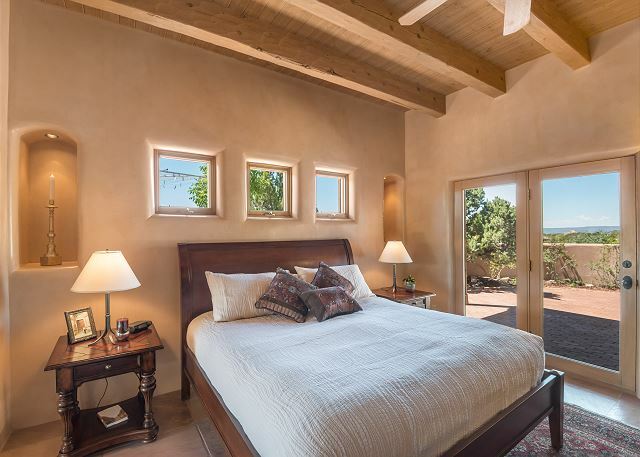 The generous and livable master bedroom with oversized windows capture sunlight and mountain views, while glass doors open to an eastern portal and a western portal. 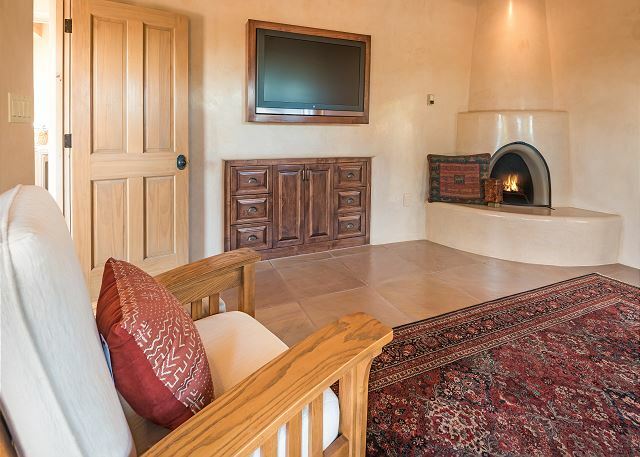 A built-in media center and a corner kiva fireplace contribute to the relaxing ambiance. 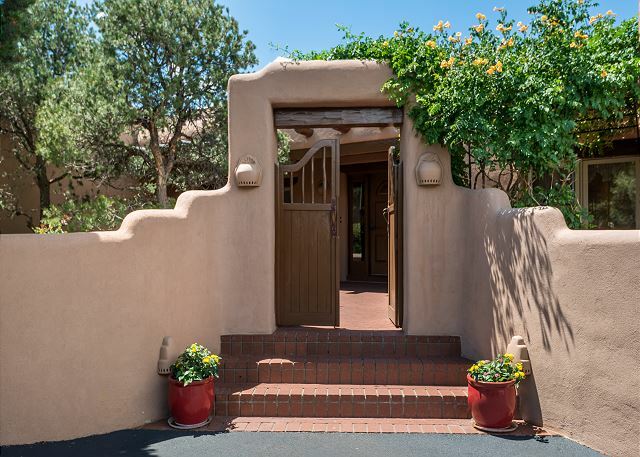 The charming, east-facing intimate portal provides a quiet, shady place to appreciate the colorful landscaping, blue sky and fresh breezes. 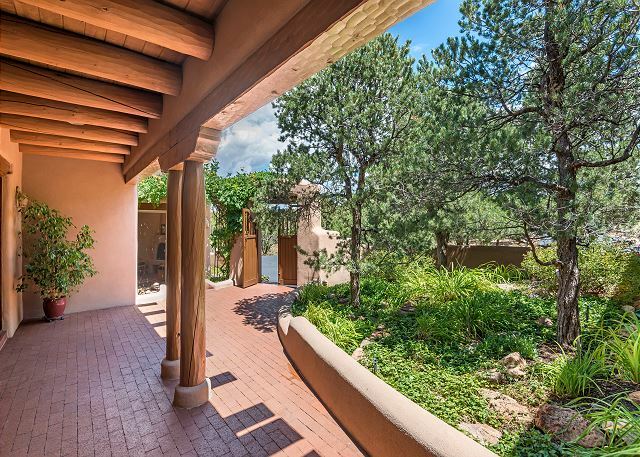 The west-facing portal and patio enjoys abundant sun or shade, and awesome mountain views. 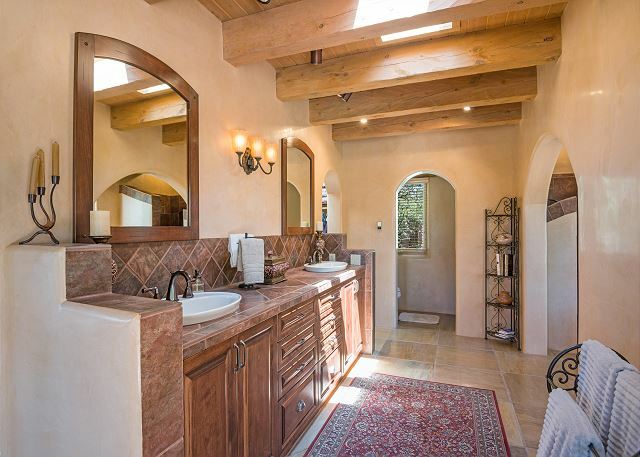 The master bath is very spacious and luxurious with swaths of elegant, richly-hued stone tile, handsome woodwork, an extensive vanity, a sumptuous tub, and a lavish walk-in stone shower., The tub is jetted and the shower features multiple heads and massage jets. 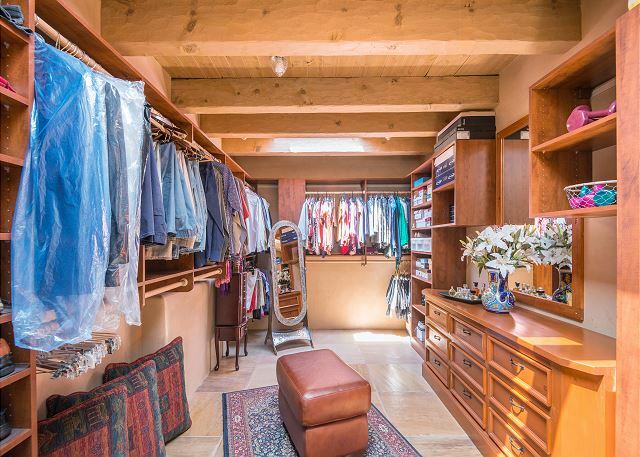 The well-lit master closet offers abundant shelving, hanging rods of various heights, a bureau with drawers, and three cabinets for additional storage. 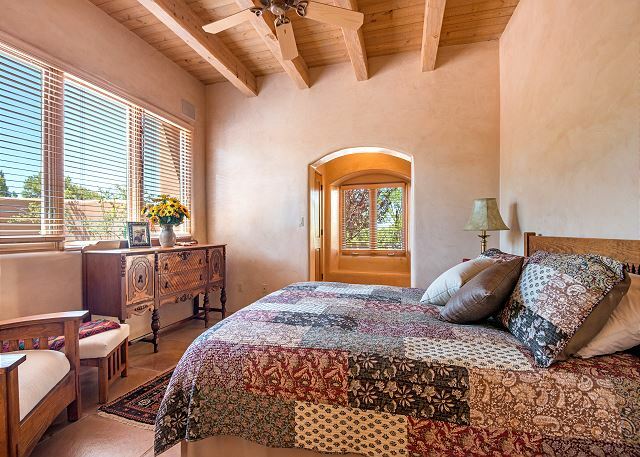 The guest bedroom is a spacious, private oasis with relaxed, charming ambience tucked away down a hallway from the living room. 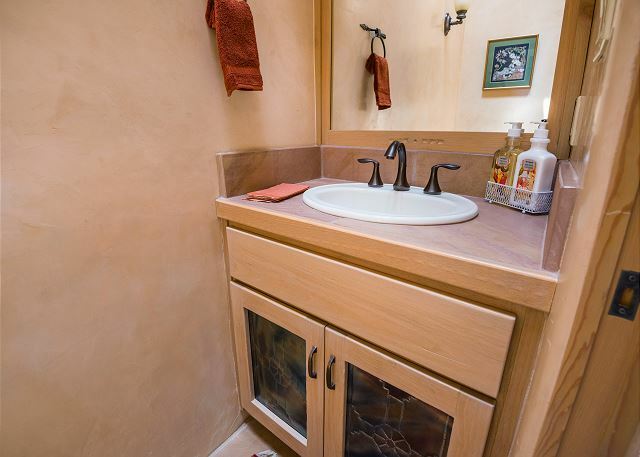 It features handsome stone tile floors, a ceiling fan, and an oversized window with a banco and mountain views. 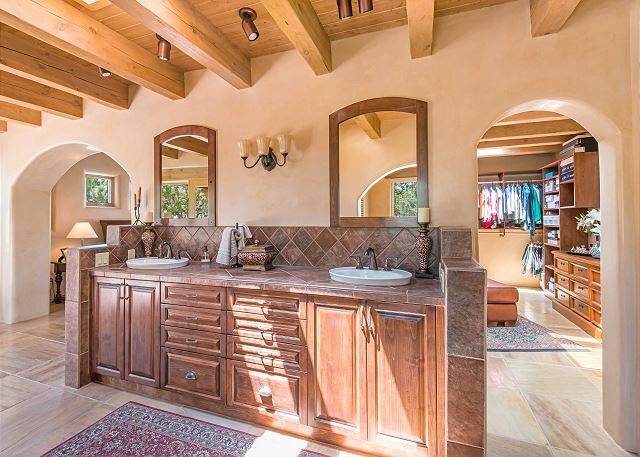 A dressing area and walk-in closet are thoughtfully designed. 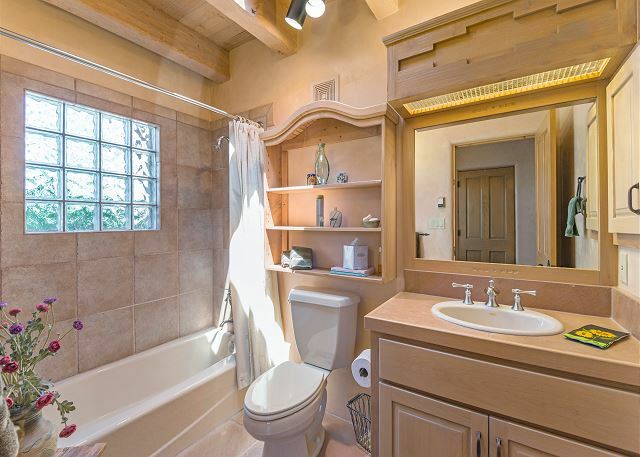 The roomy en-suite bathroom is highlighted with many stylish touches, such as a spacious wood vanity, stone floors, and a tub-shower. A skylight and a glass block wall accent fill the space with warm light during the day.